I don’t know too much about fashion, but people seem to really like my outfits, so I’ve decided to start sharing them. I don’t think I have a set “style.” My only requirements for getting dressed are that I look pulled-together and the outfit feels like me. “Me” can be different every day. Sometimes it’s boho, sometimes it’s Kate Spade. And there are plenty of inbetweens. I’ve been eying this t-shirt for a few weeks, and after returning to the store (and frantically searching through the pile for a small) I had a complete look. 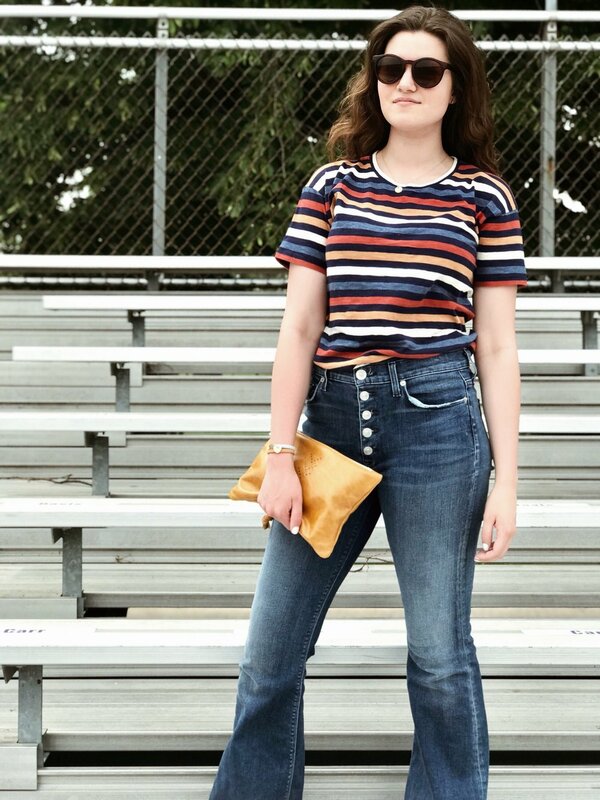 I feel a super retro vibe with this look, so my bell bottom jeans were a no-brainer. I also rarely play with color, so this was out of the norm for me. It was refreshing to feel so bright, especially on a super hot summer day.